You might hear it said that Nokia is on a knife-edge, and that this old king of mobiles will live or die based on the success of its latest flagship phone. We love melodrama as much as the next guy, but such talk is overplaying it. Sure, the great manufacturer has its troubles, and yes, the Lumia 800 bears a heavy burden of responsibility on its 3.7-inch shoulders. However, now that Nokia's CEO Stephen Elop has set his company on a new path, there will no doubt be a slew of new products -- both hardware and software -- over the next few years. In fact, the Lumia 800 was probably rushed to market, having been designed and built within the space of six months and intended as a placeholder for greater things to come. Nokia simply grabbed the overall design of its orphaned N9 handset, threw it together with Windows Phone Mango and then whatever the Finnish is for baddaboom, baddabing. So, does the Lumia feel rushed? Or is this the first stirring of something special? Read on and we'll tell you what we think. 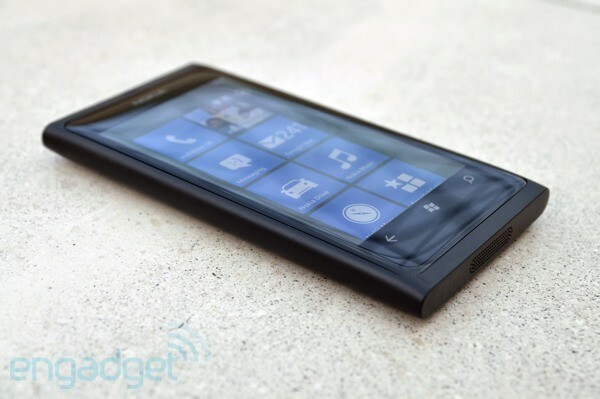 This is an attractive option if you're a fan of Windows Phone and great design. 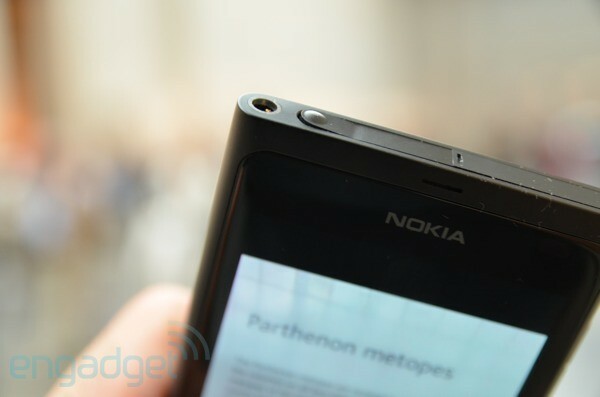 It's far from perfect, though, and Nokia's best is yet to come. 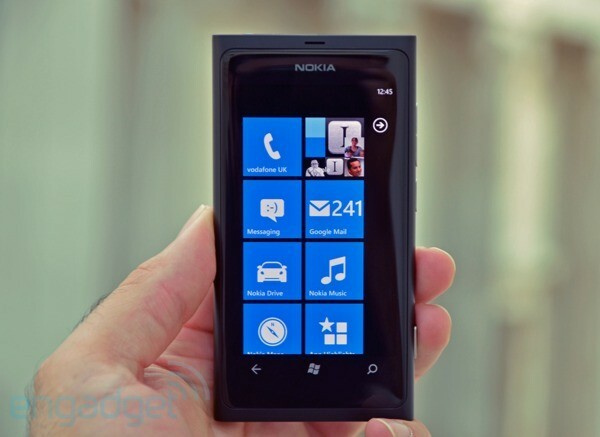 How would you rate the Lumia 800? Elop has gone on record claiming that the Lumia 800 is a "refinement" of the N9. That's not a good use of English and we can't let it slide, because every hardware difference between the two devices leaves the Lumia 800 worse off. There's no globetrotting pentaband 3G, which means no AWS support for T-Mo USA's network. The front-facing camera and notification LED have evaporated. The screen is slightly smaller due to the intrusion of the Windows Phone buttons. There's only 512MB of RAM instead of 1GB. Onboard storage maxes out at 16GB rather than 64GB with the N9. NFC is also inexplicably lacking, so the phone can't pair up with Nokia accessories and it probably won't be able to keep up future innovations that Nokia says its working on for Windows Phone 8 (aka Apollo). On the other hand, many of the best features of the N9 have made it through. The machined polycarbonate shell radiates precisely the same industrial style, while simultaneously giggling in the face of scratches. The convex Gorilla Glass screen flaunts some of the best workmanship we've ever seen on a mobile device and it fits so perfectly that barely a speck of dust can get caught in its frame. 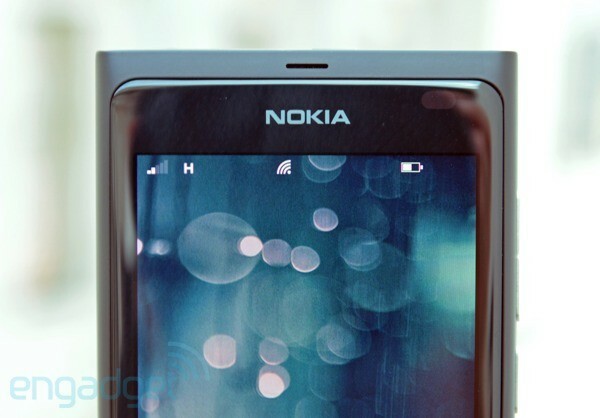 The proximity and light sensors are neatly hidden behind the glass, leaving the front face of the phone almost entirely undisturbed, except for the earpiece, Nokia logo and Windows Phone symbols. The left side of the device is a blank expanse, while the volume rocker, power / lock button and camera button are all on the right side -- and they're made of metal, not plastic. There's a neatly drilled speaker grill on the bottom, which also houses the mic. On top we find the 3.5mm jack and next to it a flap for the MicroUSB port, which you push on one side to open. Only when the flap is open can you slide and pop the micro SIM slot. It's hard to contemplate the overall beauty of this device without getting emotional, and we already blubbered enough in our N9 review. Nevertheless, this design is not without its failings, and some of those make us want to cry too. 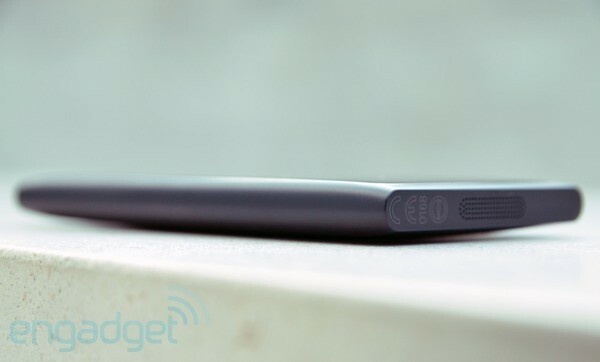 Most importantly, the plastic flap over the microUSB port is too fragile. We managed to bend it trying to close it will the drawer was still slightly open -- and we didn't jam on it hard, mind you. Exactly the same thing happened with our N9, so it's no freak accident. If you buy this device, please be careful -- the flap is replaceable, luckily, but we envisage a long queue for spares. The absence of a notification LED is annoying. The N9 had a faint 'always on' clock and notification area on the screen, but that's gone here. Aside from the fact that you have to switch the device on to see any notifications, there's another drawback: if the device is totally discharged, it doesn't even have enough energy to tell you whether it's charging when you plug it in. At that point it's pure guesswork as to when or if your device will be ready to use again. We had a couple of random power-related incidents. The phone once died suddenly in the middle of a call and flashed the battery warning, but then it switched itself back on and revealed that the battery was still at 52 percent. On another occasion, the phone initially refused to charge with an official Nokia micro-USB charger -- albeit not the one that came in the package. Both issues were short-lived, but we're keeping an eye on the behavior of our review sample and will update if anything new arises. One more thing: the sharp corners and relatively thick 12.1mm (0.48-inch) profile might not suit everyone's pocket. If we look at HTC's rival Windows Phone, the Titan, it has rounded corners and a mere 9.9mm waistline, so it manages to pack a 4.7-inch display without feeling much chunkier than the Lumia 800. As we said in our full review, the aluminum also has extremely high build quality, albeit with a completely different design. The Lumia 800 packs a Qualcomm MSM8255 single-core processor -- exactly the same System-on-Chip that powers the Titan, except that Nokia has decided to clock the Lumia slightly slower at 1.4GHz instead of 1.5GHz. Does this make a difference? Not really. In everyday use, we sometimes experienced minor lags when opening up Nokia Drive or Nokia Music, and occasional judders when using a processor-intensive app like Local Scout, but the Titan was no better. We don't expect to see any Lumia-owning geeks on the performance leaderboards. 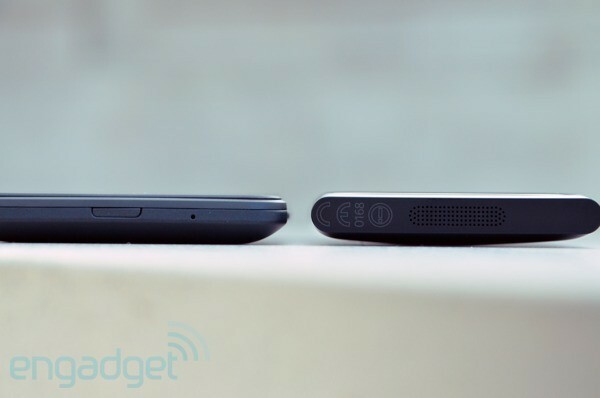 The battery is only 1450mAh, compared to the Titan's 1750mAh behemoth. However, the Lumia's smaller and more power efficient display cancels out this disparity and the two phones end up being roughly on a par. With heavy use, with a fair amount of photography, e-book reading and so on, the 800 will probably die by late evening. With more normal use, involving calls, push email and a bit of music, it could stretch to a day and a half. In the WPBench battery test, the phone lasted two hours and 40 minutes -- against three hours from the Titan. 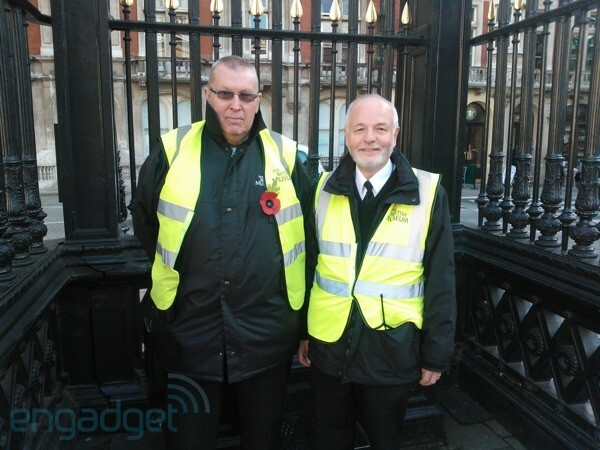 Nokia knows how to build phones, so reception and call quality were both reliably average when using the Vodafone network in and around London. There's no HSPA+, but the phone was quick to establish a 3G or HSDPA connection when available. Importantly though, the Lumia doesn't do internet tethering, whether by WiFi or cable, whereas the Titan does. Mango, say "hello" to AMOLED. The Lumia might not be the first to make this happy pairing, but it's a powerful union here nonetheless -- and if you've never used an AMOLED phone before, then you're in for a big treat. The key selling point is that any black areas on the screen are completely black. Deep, true, outer space black. Nokia has its own name for this effect -- ClearBlack -- but it's really just the same end result as Samsung's Super AMOLED technology, which is not a bad thing. In comparison, LCD panels are just a very dark grey. What's more, when you bump up the brightness on an LCD, you can take a hit on contrast, because that background grey gets steadily lighter. But with AMOLED, the blacks remain implacably perfect no matter how high you push the brightness -- producing a level of contrast on the Lumia 800 that can make your eyes throb if you deliberately mess with the settings while indoors. In practice, AMOLED gives the Lumia's display much better outdoors performance. The brightness pierces through smudges and reflections on the glass, while also delivering powerful color saturation. We wouldn't want use it for reading e-books in direct sunlight -- we've got e-ink for that -- but the bold live tiles of Windows Phone seem tailor-made for the Lumia 800's display and we'd certainly choose it over LCD for everyday use in the fresh air. The strange pixelation can be distracting. Go indoors, however, and it's a different story. Nokia is an extremely savvy player when it comes to building smartphones to a price point. With the Lumia 800 it's opted to use the slightly cheaper PenTile type of AMOLED display. Some phone users take issue with this technology, because it lowers the sub-pixel count and can impact on color rendition due to the excess of green sub-pixels. In the case of the Lumia 800, the green tinge isn't awful, but the strange pixelation can be often be distracting, like a multicolored mesh or grid sitting on top of an otherwise high-res display. Photos generally look fine, but fuzziness is clearly visible to the naked eye when it comes to text -- in particular, characters in a thin font seem to 'hum' slightly at their edges, which is a shame because such fonts are a big part of the Windows Phone aesthetic. 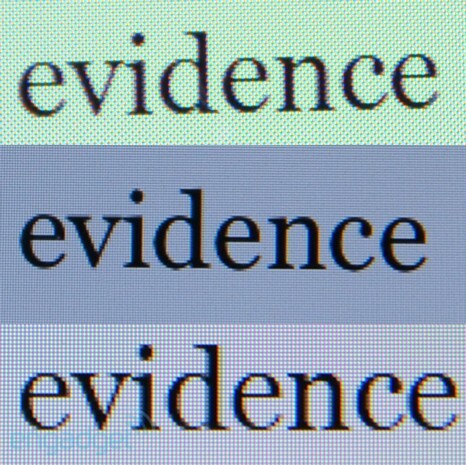 The picture above shows a snapshot of a single word displayed on the Kindle app, shown on the Lumia 800's PenTile AMOLED, then the iPhone 4's Retina Display, and then the Titan's SLCD at the bottom. Ultimately, whether this is a cause for concern depends on your eye-sight and how you tend to use your phone. If you enjoy reading e-books on your phone, then it's worth trying the Lumia 800 in-store before you commit. 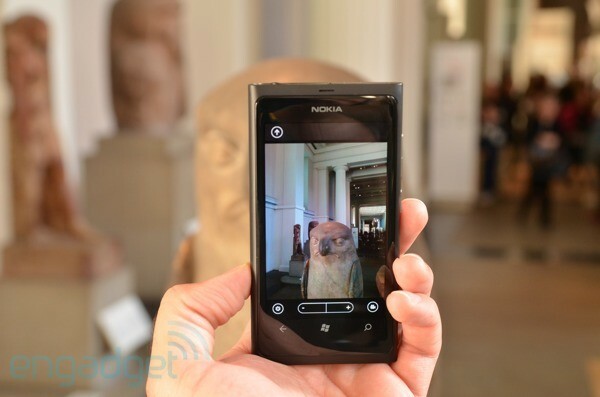 The eight megapixel camera on the Lumia 800 is exactly the same unit that we reviewed on the N9. It's been around for a while and it suffers from a few foibles, but the underlying hardware is top-notch. The Carl Zeiss Tessar lens opens to f/2.2, which is up there with the best camera phones on the market and makes for relatively good low-light performance. Coupled with the Windows Phone OS, which has a fast and easy-to-use stock camera app, as well as the AMOLED screen which is great for framing and viewing pics, this Nokia is a capable stills shooter. There are two ways to take a picture: you can either press down halfway on the two-stage dedicated camera button to set exposure and focus and then press fully to snap, or you can simply tap the screen on whichever subject you like and it will make all the necessary adjustments and take the shot all in one go. We found ourselves using the latter method more often, simply because it's so blazingly fast. A tap on the 'cog' button provides ready access to flash control and a dream-like array of manual options, including ISO, exposure compensation, metering mode, white balance, contrast, saturation, focus mode and resolution. What's more, you can save your settings so they don't get lost when you exit the camera or switch to another scene mode. The only thing missing is a setting for how much compression you want. However, the camera software generally preserves a good level of information, with file sizes mostly ranging from 1MB to 1.3MB, but occasionally reaching 2.2MB for a shot with lots of detail. The same goes for video: 720p files generally came in at around 80MB to 100MB per minute, which is far in excess of many rivals and also slightly better than the HTC Titan. 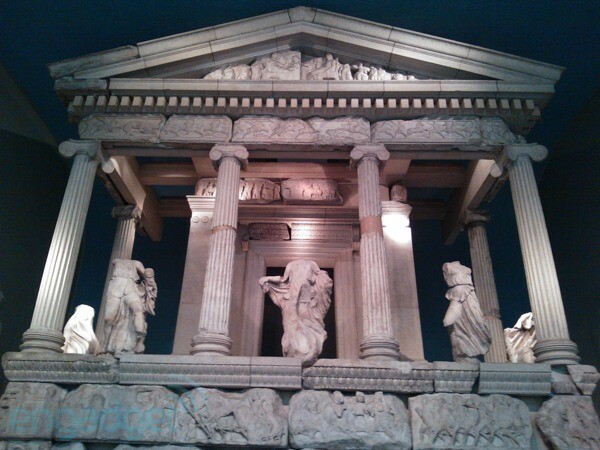 Of course, the Titan also has a f/2.2 lens, the same maximum resolution and the same underlying camera software, so we took the two phones out for a spin in the British Museum in order to get a more detailed comparison. Our verdict? It was a close contest, and ultimately we'd be content with either camera in our pocket -- but there are a few differences worth mentioning. 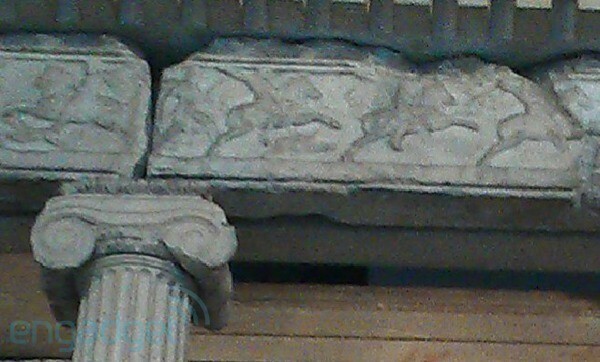 The Lumia 800's auto white balance often struggled with the varied lighting at the museum, which has artificially lit displays underneath big tinted windows in the ceiling. We had to manually set white balance on a couple of occasions, whereas our Titan generally seemed to pick the right compromise. 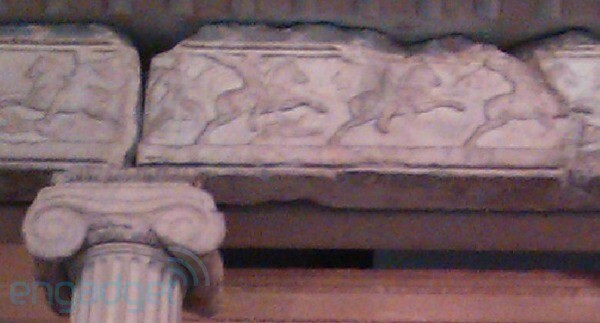 Below is a highly zoomed-in section from the Lumia shot, which shows a pink cast. Below that is the equivalent from the Titan, which is more accurate. In a our sample video below, we moved the camera from very blue light to very warm light and it actually coped quite well. It's the more the subtle stuff it struggles with. 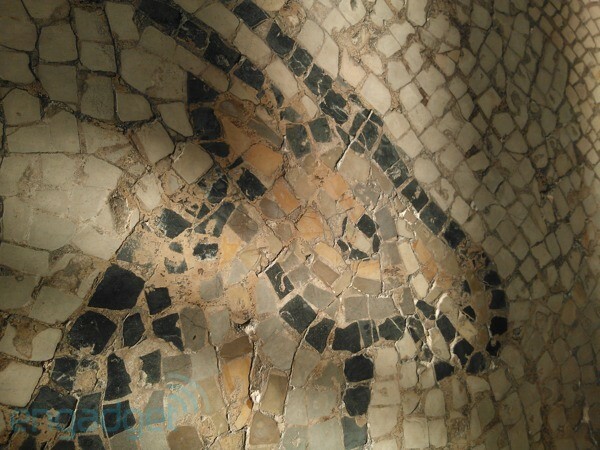 Our sample video also shows that the Lumia's autofocus was occasionally slow during recording. It wasn't always that bad, but it was certainly inconsistent. Exactly the same can be said of the Titan, though. Neither camera handles autofocus very well during video, unless your subject is inorganic with lots of straight edges. Any fast motion or panning also destroyed the quality of our 720p video, largely because the compression couldn't keep up -- VGA mode handled motion a lot better, but who wants to shoot in that? But again, the Titan also suffers from this, and in fact the Lumia's compression system copes marginally better. Overall, we need better bit-rates and better autofocus on smartphones before we stop carrying our little video camera around with us. Returning to still images briefly, we also found that the Titan's were generally sharper and had slightly higher contrast by default. The antelope eye below is from the Lumia, whereas the sharper one below that is from the Titan. However, this doesn't necessarily mean the Titan's pics were better, and in any case the Lumia could easily be re-configured to deliver the same results. However, the Titan also has useful Panorama and Burst Shots modes, which are missing on the Lumia 800. Factoring in the white balance issue, we'd have to give the Titan's camera a slight edge in this contest -- but phones on other platforms, like the iPhone 4S, Galaxy S II and Galaxy Note have all-round superior cameras. There's a good chance that the Lumia 800 will be your first Windows Phone, so it's worth checking out the quick overview in the software video above. If you want the full low-down, then please peruse our in-depth Mango preview, as well as our review that was updated when the OS update was finalized. If you'd prefer a very quick summary, then take it from us that this OS is fast, fluid and nice on the eyes. Its visual design is a boon not only for ease-of-use -- particularly for people with poor eyesight -- but also in terms of its sheer sassiness, which will be appreciated by anyone who wants to stand out from the iOS and Android crowds. This OS is fast, fluid and nice on the eyes. The navigation system rarely throws too many options at you, and often cuts out more advanced options altogether. 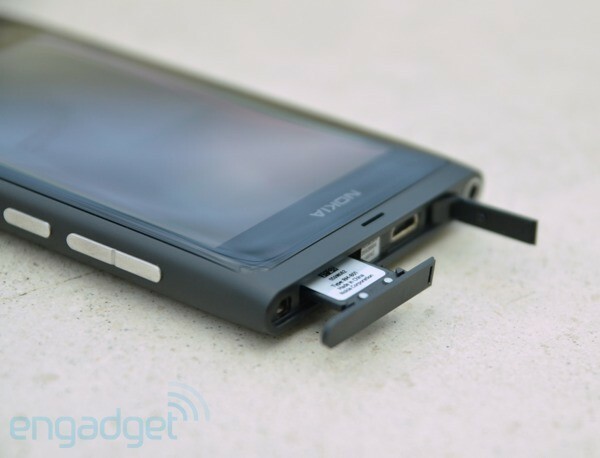 In particular, we miss USB mass storage -- a feature we rely on with our Android phones. It's also a shame that you can can't display multiple Google calendars -- the OS will only display the primary calendar for any account, which is out of keeping with this otherwise very productivity-focused OS. 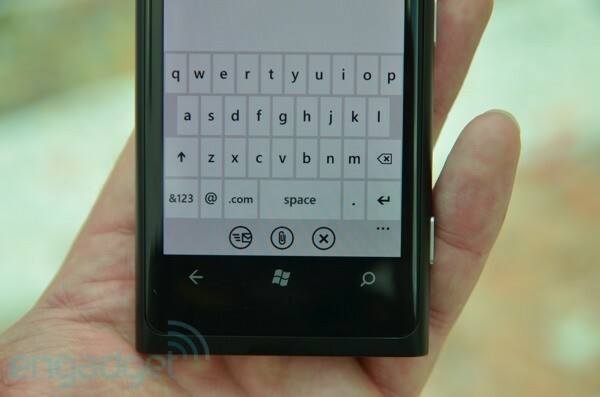 The WP keyboard, as always, gets a special mention for being extremely easy to use. It works great on the Lumia 800's screen, but we found ourselves making slightly more mistakes compared to the Titan, whose keys are easier to hit simply because they're bigger. Although Windows Phone is still lacking many of the apps that have become popular on other platforms, including Spotify, Dropbox and countless others, it handles core functions rather well, such that you don't necessarily need extra apps in order to handle basic social networking, photography, maps, search, music recognition and purchasing, cloud storage, folder syncing, and other daily tasks. These functions aren't perfect -- advanced Tweeters may struggle with the limitations of the integrated software, for example, which requires you to use SkyDrive for hosting your pictures. However, the Marketplace is growing daily and will offer more dedicated apps over time -- after all, it has the full weight of Microsoft behind it. Nokia is going way beyond the call of duty in providing its own apps, which already help to distinguish the Lumia 800 from the competition and will certainly become more of a selling point over time -- particularly when Nokia's Pulse social networking platform emerges from beta testing. In the meantime, Nokia's proprietary offering amounts to three key apps. 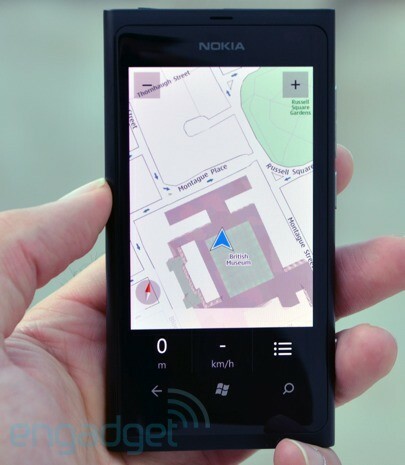 First and foremost, Nokia Drive turns your handset into a fully featured sat nav, based on the Navteq platform that covers 90 countries and also works with offline maps. Need to get from A to B in Mozambique? Then download the 15MB file and off you go. The coverage puts Google Maps and TomTom to shame. You get full voice instructions too. 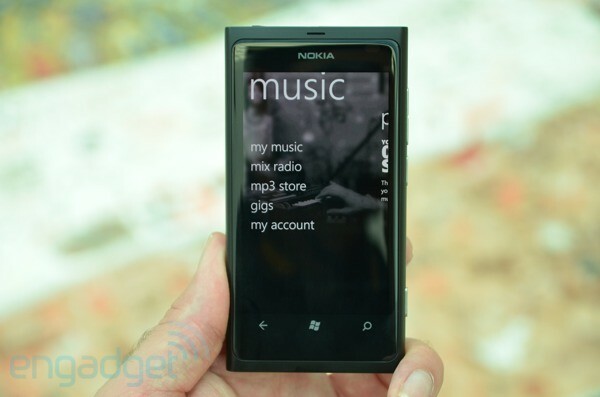 Nokia Music adds to the stock player by giving you access to Mix Radio. This is a neat little radio player with eclectically titled categories (e.g., "Golden Era Hip-hop"), which let you narrow down your genre while still leaving it open enough for some unexpected tunes -- so long as you have WiFi access or a cheap cell data plan. The audio quality is on a par with the free version of Spotify, for example, so it won't satisfy audiophiles, but it's fine for listening on the go or plugging into a small dock. Finally, Nokia also supplies an app discovery tool called App Highlights, which suggests essential apps like Kindle, eBay and AccuWeather as well as promoting others you might not be aware of. It also has a little gimmick where you shake your phone to be shown a surprise app -- completely pointless, but it emphasizes the underlying purpose, which is simply to encourage to savor the generally high-quality offerings cherry-picked from the Windows Phone Marketplace. Nokia's Lumia 800 is a sophisticated and capable smartphone that melds its hardware beautifully with the Windows Phone OS. Whether it's the best phone for you right now depends on certain factors. First, you need to establish whether you're a Windows Phone type of person. If you're thrilled by dual-core processors, extremely high-res screens, large camera sensors, customizable widgets, expandable storage, USB mass storage and other such features, then you'll be better off with Android or -- to a slightly lesser extent -- iOS, because that cutting-edge stuff is currently absent on Redmond's OS. On the other other hand, if you want to be part of a carefully crafted, simple and generally happy emerging ecosystem, then look no further. The next question is whether you'd choose the Lumia 800 over another Windows Phone, such as the Titan. The Titan's camera is slightly better, but not enough to be a deciding factor. 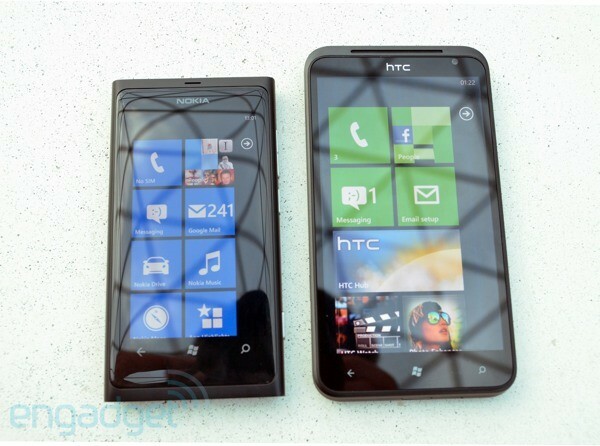 Conversely, the Lumia 800's design is arguably superior, but not massively so. Instead, it's the display that's the more important issue. If you want a bright and colorful screen for media and general use, and you're not too fussed about the PenTile pixel issue (which you ought to see for yourself before buying), then the Lumia 800's AMOLED display wins hands-down. However, if you prefer a bigger screen that does a better job of displaying text, then go with the Titan. Some people will notice that Nokia is building a special relationship with Microsoft, to the point where the manufacturer is able to deliver more exclusive features in its phones and push for things to be added in later revisions. If you're a WP fan, then there might be an argument for committing to Nokia in order to benefit from all those good things to come. However, we think that's premature. Drive is a nice exclusive feature, but there's not much else yet. If anything, the Lumia 800's hardware risks being left behind as Nokia develops apps and platforms based on NFC, front-facing cameras and other (unknown) features that are likely being prepared for Windows 8 Apollo. The Nokia-Microsoft relationship will certainly become more important, but that's not enough to sway a purchasing decision today.